Carrier vibrating fluid bed sand coolers are designed to cool hot return sand to temperature and moisture levels ideal for mulling. Patented fluidizing drilled decks evenly distribute air into the sand bed, preventing hole pluggage and maximizing thermal efficiency. Special hood design minimizes dusting for uniform exhaust velocities. The result is consistent return sand temperature and moisture content. Evaporative sand cooling process provides maximum thermal efficiency. Fluidization with vibration mixes and turns the sand bed, eliminating hot spots. Because the sand moisture is evaporated while cooling, the cool sand is consistent in temperature and moisture. Air volume controls regulate and maintain supply and exhaust air volumes at a constant pre-set level to prevent fines entrainment and sand weepage. Continuous plenum discharge incorporates a double seal to discharge weepage sand if loss of supply air should occur. 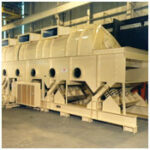 Special sand dryer hood design minimizes dusting and produces more uniform exhaust velocities. Consistent return sand temperature and moisture content. Minimal sand dryer system maintenance – there are no moving parts in contact with the sand. For more information on Carrier sand coolers, refer to brochure #16618.